WINSOME is back with us for her annual refit, and this winter we are carrying out Non Destructive Testing (NDT) on her rod rigging. We have also dropped her rudder for some corrosion repairs and general servicing. 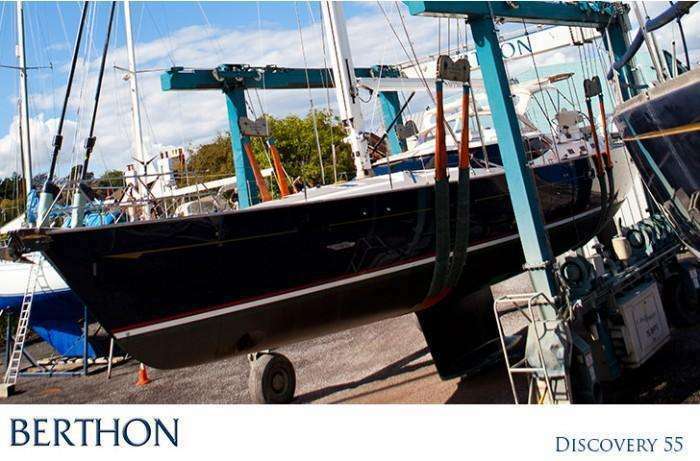 The Berthon Refit team will also complete some paint repairs to her topsides after another action packed season of racing that has taken its toll. At the same time, the Berthon paint team is also repainting her deck, so she will be gleaming and ready for another full on season of regattas in 2015. December in the Big Blue Sheds sees not 1 but 2 teak deck replacements underway, and co-incidentally they are both on X-Yachts – an X-412 EXIMUS and an X-442 TEXA. This will be the 7th deck replacement carried out at Berthon in 2014, which has seen Berthon shipwrights replace over 200 square metres of teak. Both our X-Yachts are having Moody decking systems installed. We used this great system on the 68’ Mainsail built JEWEL, whose new deck was completed in the autumn. 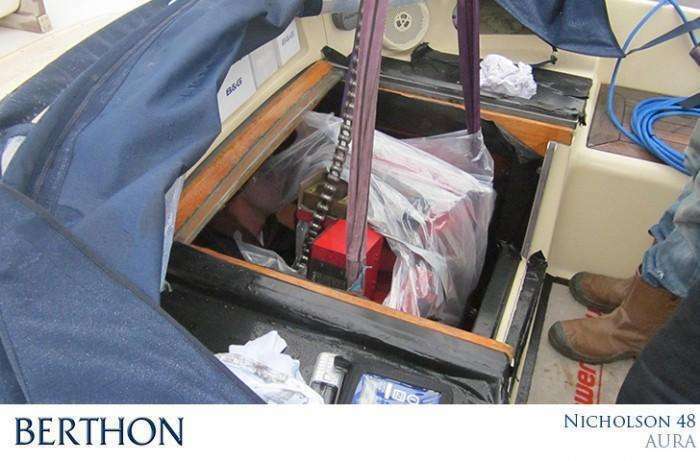 Nicholson 48 – This yacht is in mid engine room refit; Berthon engineers have fitted new Yanmar 4YH80 which is the latest generation of their diesel marine engines. Alongside this is a fab new Onan 6kw generator and charging system, providing more than enough power for all the yacht’s services whether sailing or under power. The removal of the old units and replacement of these large pieces of machinery has meant that our Shipwrights have been busy with new interior joinery to make this a truly invisible mend. 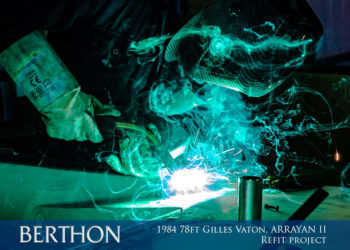 On another front, the Berthon rigging team have been extremely busy. They have replaced the standing rigging on a variety of yachts ranging from a Discovery 55 to Grand Soleil 50, Beneteau Oceanis 361 and a Magnum 42. Berthon’s boat moving team are thrilled with their early Christmas present pictured here in the form of new boat moving equipment as well as a host of new cradles. 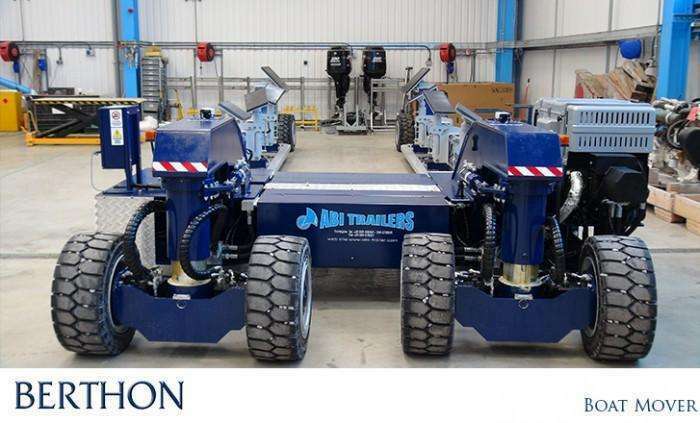 The new boat mover was supplied by the Italian company ABI Trailers, and is rated to 45 tons. It is fully remote controlled and cleverly moves the cradle and yacht together. This will allow our boat moving team to position yachts closer together ashore giving us more space for storage. This funky box of tricks is also quicker and more manoeuvrable than our current kit. Berthon has also been very busy with the RNLI Shannon class lifeboats this month. 13-02, THE MORELL was back with us from Dungeness Lifeboat Station, for a quick pitstop to update her to the current build specification. 13-06, EDMUND HAWTHORN MICKLEWOOD returned to Berthon following the successful completion of crew training for final updates prior to delivery to Hoylake where she is now on active duty. 13-07, RNLB REG has just started a rigorous Builder’s trials programme at Berthon prior to acceptance into the RNLI fleet where she will become a relief boat. Handover is scheduled for 15th December. 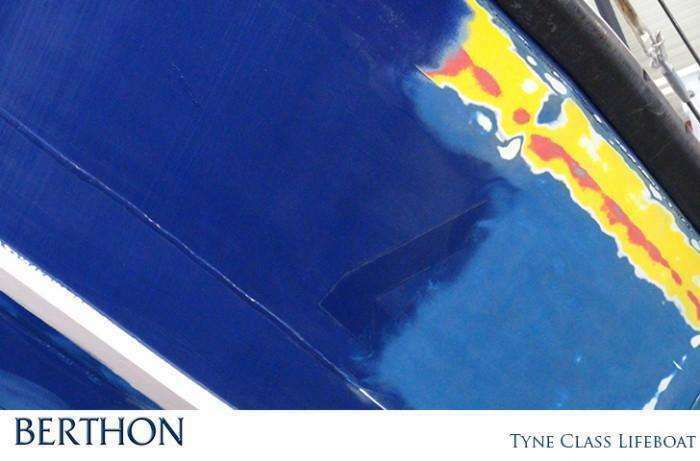 Our state of the art paint facility is currently home to a Tyne class lifeboat which is now privately owned and she is with us for a nautical makeover. She was originally stationed at Appledore in Devon and was called the GEORGE GIBSON. Her rugged steel hull is having copper coat beneath the waterline (sufficiently insulated from the steel with GP120 epoxy primer from 3M!) and she is having smart new orange and black topsides paint to fit her for her new role as a safety boat where she will be looking after a nuclear installation the Bristol Channel. She is also having new non-slip deck paint to compliment new lines, and a new name – the JOHN FAULDING. We wish her well in her new life. 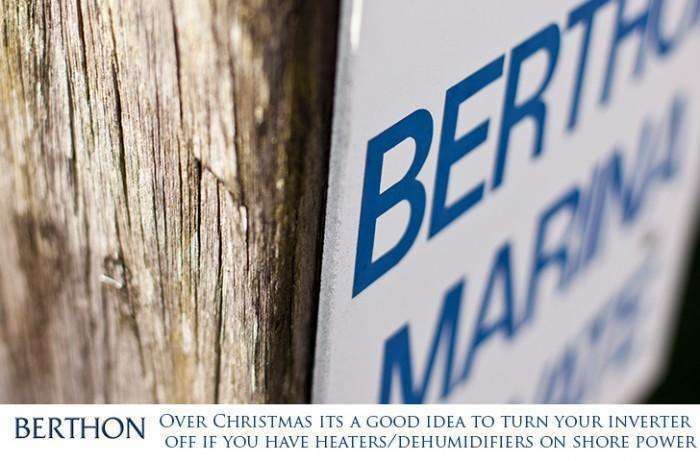 If you have an inverter on board and you are not going to be visiting your yacht over the Christmas holidays, then it is a really good idea to turn the inverter off if you have heaters or dehumidifiers (or both) running when connected to shore power. If you would like us to do this for you, call or email Tom Wright (marina yachts), or James Hollingsworth (brokerage yachts) at the recently expanded Yacht Maintenance and Repair (YMR) department.